Many youths were seen sitting in the front row wearing NaMo merchandise and waiting for TV cameras to capture their support for Modi. T-shirts, pens, badges and masks — embellished with Narendra Modi’s catchy messages — are on sale, wherever the Prime Minister goes, Namo Raths follow him with all the sellables this election season. So, you have T-shirts being sold anywhere between Rs 499 and Rs 899, and other knick-knacks costing Rs 150, going up to Rs 500. That’s for anyone who wants to see and hear Modi at his rallies. All of it was evident in Meerut on Thursday when he formally launched BJP’s Lok Sabha poll campaign. The party expects to raise people’s involvement by cashing in on the Prime Minister’s popularity. Modi was scheduled to address the party rally in the Uttar Pradesh city at 11 a.m., but by then scores of people had already lined up before the Namo Rath to buy whatever was on sale — all in Modi’s name. 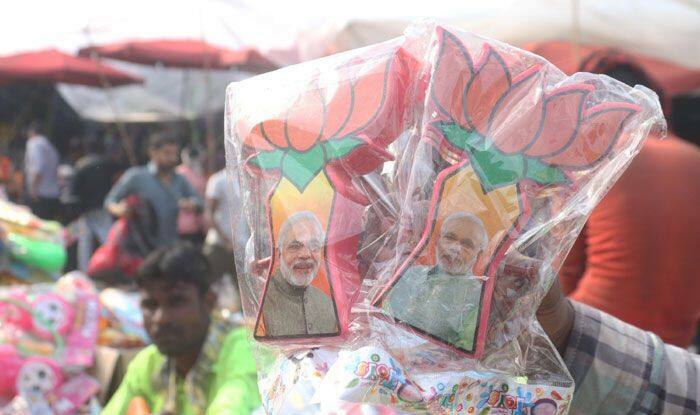 People wore them at the rally as they enthusiastically cheered Modi. Many youths were seen sitting in the front row wearing NaMo merchandise and waiting for TV cameras to capture their support for Modi. Days ahead of Modi’s rally, two saffron-coloured mini-trucks with huge photographs of Modi went to various places across Meerut and Muzaffarnagar to sell the merchandise. The BJP has already made it clear that the money collected from the exercise will be donated to the ‘Namami Gange’ project aimed at cleaning the river. “Today, NaMo Rath is in Meerut, India!! Use this chance to show your love for NaMo and shop your favourite NaMo Merchandise!,” said a tweet on the NaMo Merchandise handle. BJP leaders said that NaMo Raths will ensure better connect with voters. “People wear them as an expression of support for Modi. At his rally, people wear the merchandise as a reflection of their enthusiasm for him,” a party leader said.